This oil-less piston compressor(Airbrush Compressor) is an excellent choice for users who need high quality spraying effect. It has a 3L air tank that has its pressure maintained automatically by the compressor. Experience excellent control and enjoy steady, pulse-free, clean painting with easily adjustable output air pressure. It is perfect for your spray painting art, also for nails & temporary tattoos, cake decorating, craft painting, etc. 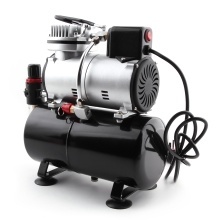 Piston type and oil-less air compressor with 3L tank. Constant pressure with pulse-free output and zero pulsation. Thermally protected function and low noise. The compressor features an easy-carry handle. Rubber feet are great to protect your work surface.